Anyway, here’s a look at another Title Page from The Batman Strikes!, featuring another hand-drawn story title logo. This one features Catwoman, and I should say something about her design here. Like all the major villains appearing in The Batman Strikes!, Catwoman’s design is based on animation models from the animated TV show the comic was a tie-in for. This Catwoman costume had large yellow goggles, presumably influenced by the then-recent Darwyn Cooke redesign of the character. The animation design also had a loose collar, which could pull over her head as a hood for added stealth. That’s one of those ideas that sounds cool on paper but then doesn’t get used much in practice. I could be mistaken but I suspect that Catwoman was first seen on the show lowering the hood to dramatically reveal her mask and then it never went back on. I’m pretty sure she never had it up in any of the comic stories I drew. But the main thing about this Catwoman design that was – I’ll be generous and call it controversial – with fans were the ears. Now if you look at her, I see what they were going for. The ears are actually more anatomically in proportion with her head for certain breeds of cats, and the big ears I think actually add to the overall slinkiness of the figure. And this Catwoman was meant to be slinky! But whether it’s Catwoman, Batman, or a host of other costumed characters emulating those or similar animals, there has become something of a tradition that the ears are represented by stylized little triangle shapes, and it’s somewhat disconcerting to see these huge cat wars sitting o Catwoman’s head. I actually found the mask fun to draw, but much like this animated series’ version of the Joker, fans were vocal about their dislike of the design every time the character showed up. Here’s the full penciled page. 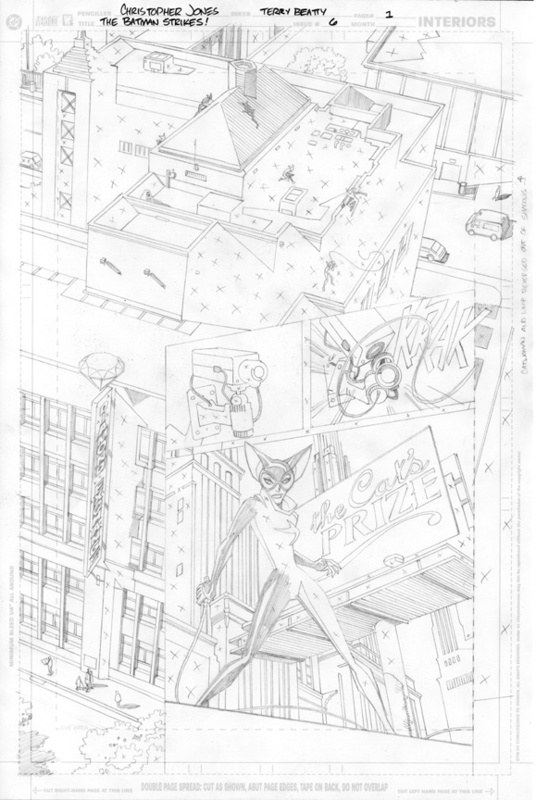 Notice the really elaborate city background and the tiny figure of Catwoman climbing over it in multiple images. I’m a big fan of Marshall Rogers work on Batman, and the biggest lesson I learned from his work is that when drawing Batman one of the main characters of the story is Gotham City. Putting the characters in a rich, detailed, vast Gotham really makes them sing. As a bonus, one of my hand-drawn sound effects appears here as Catwoman’s whip takes apart an inconvenient security camera. The sound effect is a simple one, but I always like to design sound effects myself when I can, so I can better integrate their shape and placement into the design of the panel. And finally the finished page. More to come soon! Want a sneak peek at Young Justice #9 before picking it up at your local comic shop or buying the digital version online? World’s Finest Online has several preview pages up. Click the image to check ’em out!